It has been a long, hard week and you deserve some relaxation time. Well, I'm assuming you do. If you've been slacking off all week, please disregard. Go pay full price for your apps. Everyone else, read on. 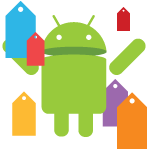 Today's sales are presented by ikoid, where you can get a bundle of Android games for one low price. The current bundle includes five games for just $3.99.